A delicious and simple to make red quinoa salad with apples, pears, pistachios, dried cranberries + cherries, and topped with a fresh homemade lemon poppyseed vinaigrette. It’s a crazy thing that I just discovered how delicious apples are in salads. Particularly spinach or mixed green salads. They add some nice crunch and tons of flavor. 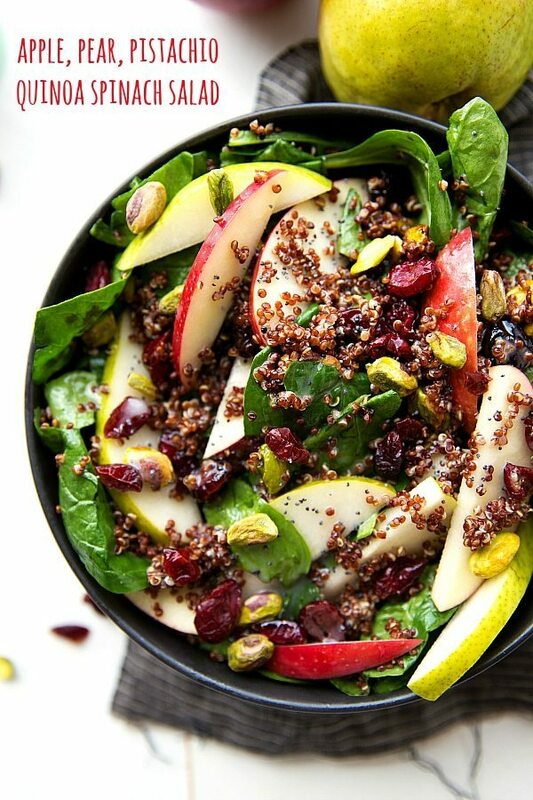 Mix those crunchy apples with some quinoa and lettuce + some other fun ingredients and this is one of the best salads ever. Plus, there is a lemon poppyseed homemade dressing that is as easy as squeezing a lemon and blending a few ingredients together. The babe (I’m going to have to start calling him toddler so we can distinguish against him and our new little one coming soon!) helped to make the dressing for this very salad. We recently taught him about his arm muscles and how to flex. He’s so dang proud of his muscles that he will show them to anyone at anytime. Naturally when I told him I needed his muscles to help squeeze a lemon, he was beyond excited to help. In between spilling lemon juice out of the measuring cup and showing me his muscles he was so vigorously using, we eventually got enough lemon to make this dressing perfect. It’s just the right amount sweet to tart and just a tiny bit creamy. I did try some olive oil instead of vegetable oil in this dressing, but unfortunately did not like the results at all. So I do recommend sticking with the vegetable oil OR trying a different poppyseed dressing that you already know and love. Or, of course, a delicious store-bought dressing will always work. 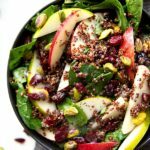 The quinoa not only makes this salad filling (and packs in some good protein), but the way it is prepared really makes it shine through in this salad. Instead of cooking the quinoa in water or chicken broth, it get’s cooked in Silk unsweetened almond milk. This gives it an amazing nutty flavor and adds so much to the overall salad! Quinoa tends to have a nutty/earthy taste anyways, but by being cooked with the almond milk, it’s definitely a heightened flavor. The other thing I do is mix in a couple of tablespoons of the dressing in the quinoa right after it has finished cooking which really soaks in the dressing and all of those flavors. Prepare the quinoa by rinsing it in cold water in a fine mesh sieve. This removes the bitter saponin coating. Combine the quinoa and water, or broth in a small pot over high heat. Bring to a boil and then reduce the heat to low and cover the pot. Cook until all of the liquid has absorbed and the quinoa has "popped." Remove the lid and allow the quinoa to sit for 3-4 minutes. Pour in 3-4 tablespoons of the dressing (make while the quinoa is cooking) and stir well. Place the quinoa in a bowl in the fridge. While the quinoa is cooking, prep the other ingredients starting with the dressing. Combine the lemon juice, lemon zest, onion powder, dijon mustard, salt and sugar in a blender or food processor. Blend or pulse until completely smooth. Slowly pour in the vegetable oil and blend. Rinse and dry the spinach. Remove the stems and place in the bowl with the completely cooled quinoa. Slice the apple and pear into thin slices (or chop) You can remove the skins if desired, but I love them on! Toss the pear and apple with the lemon juice and then add to the salad. Add in the pistachios and dried cranberries + dried cherries. Toss all of the ingredients together with the dressing and enjoy immediately. If desired, add some grilled chicken or cheese to this salad. We like feta or shredded swiss cheese best! Chelsea, this looks so fresh and delicious! I haven’t eaten dinner yet, and looking at these pics has me wanting to gnaw my arm off! I love the color in this dish, and I do need more meatless recipes. Thanks for sharing! 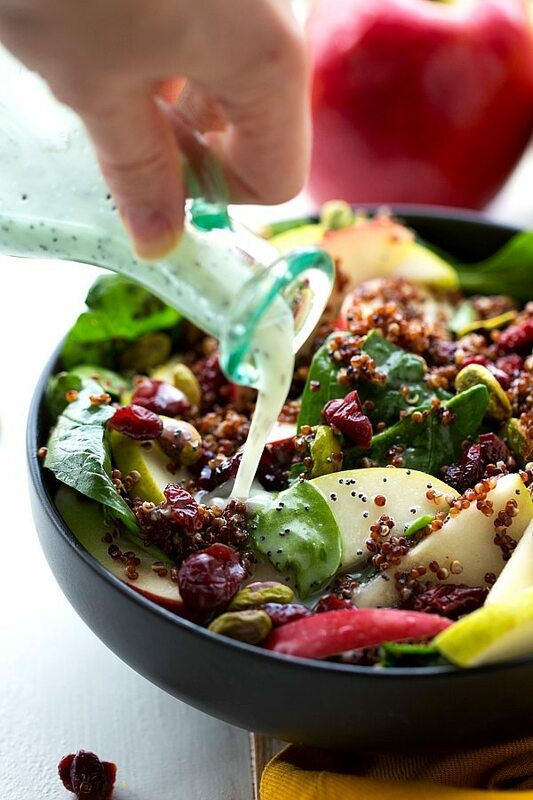 Mmmm I love poppyseed dressing and apples in salads…this is right up my alley! Apples and spinach are one of my favorite combos! I love that you used quinoa in here, Chelsea! What a perfect meal for the fall! This looks delish! 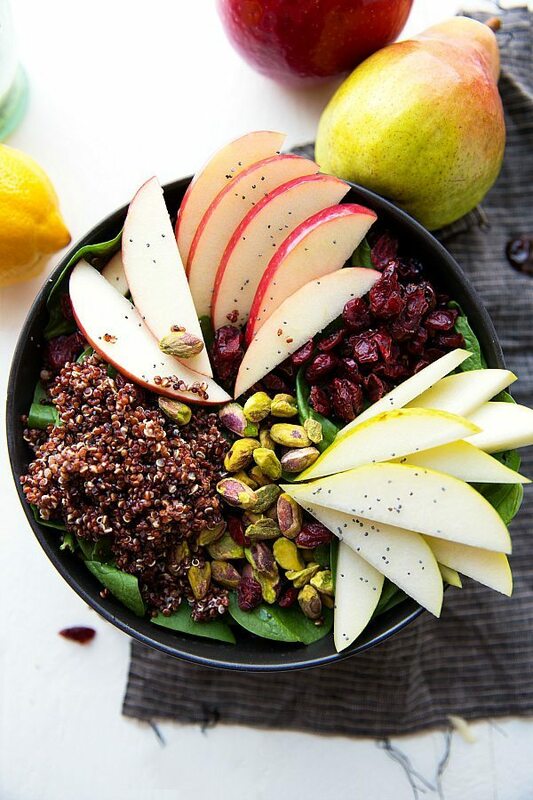 Love the quinoa pistachio combo! Such a beautiful salad. I love every component of this dish and am happy for your reminder to integrate quinoa in my salad! Thanks for the share! This salad is GORGEOUS! You just reminded me that I should really use apples more in salads…they ARE delicious! This is such a beautiful salad Chelsea! 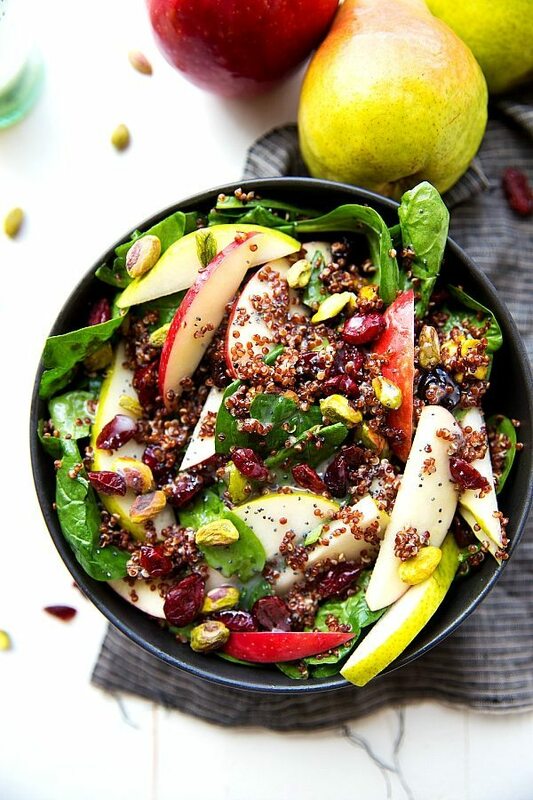 Love the quinoa and all the amazing fall flavours! I love using apples in salads! This sounds absolutely delicious with the quinoa and that dressing! This salad sounds (and looks!) amazing. 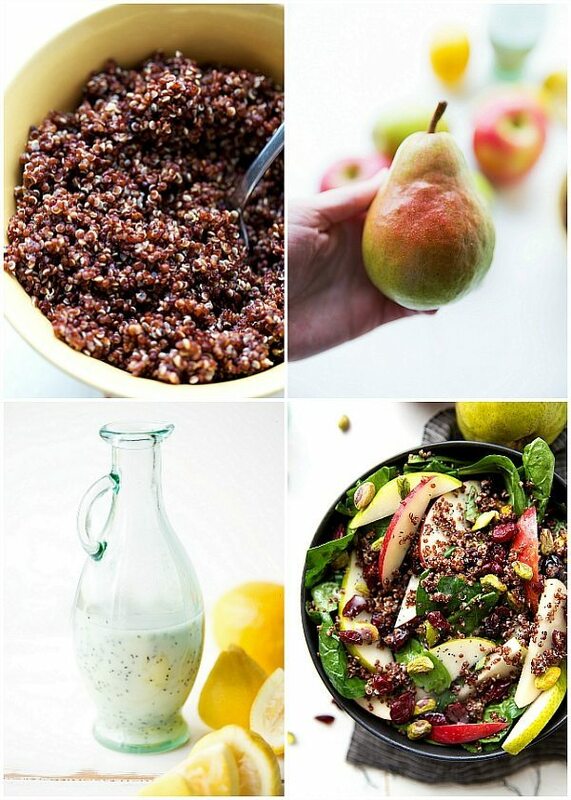 This recipe has definitely inspired me to seek out some red quinoa, it’s gorgeous! Isn’t it so pretty?! I love it! Thanks so much Stephanie! You’re welcome! 🙂 So glad it was a hit!